You'll be £12.00 closer to your next £10.00 credit when you purchase ShipCraft 19: County Class Cruisers. What's this? This volume covers the British 10,000-ton 'Treaty Cruisers', thirteen of which were built to three slightly varying designs between the wars. With three funnels and a high freeboard, they were impressive ships, and all enjoyed very active wartime careers - three were involved in the Bismarck action and another with the sinking of the Scharnhorst. County class cruisers were large 8in gun warships of the British and Australian navies built during the late 1920’s and were the most powerfully armed warships in those navies below Battleships and Battle Cruisers. Ships with guns of that caliber were not repeated and the RN went instead to more economical cruisers with smaller guns. This book by Les Brown is rather like the Sci-If ‘Tardis’ in that it’s outside belies the tremendous amount on the inside. Ostensibly intended mostly for modelers the book is actually a gem of research by the author, covering the design and progressive improvements to each ship as the reader advances through the pages. Although supposed to be brief histories of each ship, what is actually provided puts many larger publications to shame for the detail provided on areas of service, battle history and fate of each vessel of the type. It is also historically accurate as I noted from my personal knowledge and doing some basic checks via my own sources and book collections. There are none of the silly and sometimes blatant mistakes such as in the recent series on British cruisers by Osprey. Because of its original intent being for modelers there are fourteen excellent colour drawings by the talented Eric Leon, along with plans by A.D. Baker III. These are backed by numerous photographs of detailed models by some of the best in the hobby. A section also covers the commercial models available and those that were available in recent times. Examples are shown of many models both finished and under construction. Photographs of the models shown are excellent, but those depicting real ships are very clear and informative, rather than just standard views of various ships. This gives a freshness to the book that is lacking in other publications that simply repeat the same old stuff. Often inaccurately, whereas this volume is superb for its accuracy and outstanding for its presentation. Even for the big book people, this one will be a delight and worth having in your library. 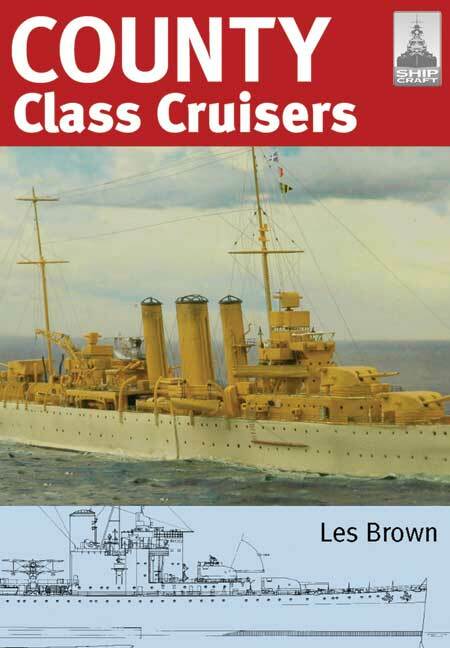 This is the latest book in the Ship Craft series and provides in-depth information about building and modifying model kits of famous warship types. The book consists of many line drawings and paint systems together with historic pictures of these warships and an extensive list of model kits. An excellent book for the model maker or naval researcher.